What If? The Movie | Let's Live Forever! I was so excited I nearly fell off my chair. My heart was thumping. I had just discovered What If? The Movie. It is two hours long and is available now, on DVD and to watch online. Other versions are coming. What if you held the key to unlocking the greatest discovery of mankind? What if aging is only a program we learned that can be changed? What if we are not victims of our genes? What if the laws of physics don’t apply when you’re truly living in the moment? What if the greatest power in the universe is within you? If you are a regular reader of this blog you might see why I got excited. There’s a trailer of the movie on the website, too. Be prepared to question your reality as you are introduced to extraordinary individuals who are achieving the miraculous. This movie is described as an “enlightening, powerful film that is being hailed as the next What The Bleep Do We Know“. Personally, I thought What the Bleep… was good, but it didn’t really break new ground—not for me, anyway. Or maybe I thought it was preaching to the converted. I suspect this one might go that extra yard that could really make a difference. Perhaps we are ready for it. What do you think? Will you be interested in watching this movie? Hi Robin. Would I be interested in watching this movie? Yep! I look forward to exploring whatever opportunities there are. robin, it’s hard NOT to want to watch this movie. what if is just an intriguing question….it is the key to unlocking a lot of “mysteries” and a great way to stumble upon things never imagined. i’ll check out the site later. it’s a great way to find answers, like what if we don’t have to die. i love it. Genes are merely blueprints, while it’s the mind that is the contractor that makes the real decisions. OK, that got my attention! You have wet my appetite, looks like it is a must see movie. I would be skeptical, but yes, I would definitely be interested in watching. Hi Robin: I have “The Secret” (DVD and book) which I watched and read. I also have the DVD of “What The Bleep Do We Know“ but I haven’t watched it yet (I know I should, but right now all my TV time is for CNN or Christmas movies 🙂 ). I hadn’t heard of “What if . . . ” but it sounds really interesting. Thank you for bringing it to my attention. I’ll look for it after the Holiday season. @Lance – it is a powerful question, isn’t it?! @Davina – it’s an amazing time, I think, of new possibilities. @Natural – I wonder if it will explore the “not dying” issue – or just leave it at questioning aging. @Al – welcome back! That got my attention, too – I think I’ll discuss that bit in my next post. @frostygirl – Hi there and welcome! I hope so, seeing I’m promoting it! I won’t have time to watch it till after Christmas, I think. @Vered – I hope it’s interesting – I will be very embarrassed if it isn’t! @Chris – where there’s a will there’s a way! @Marelisa – I have had a note to get out ‘The Secret’ stuck on our fridge for about a year – and I have never got around to it. I simply MUST! The “what if” question is all about unlimited possibilities. It’s cliche, but so true…the only limitations that exist are those that we put on ourselves. Everything is impossible…until someone does it. Clem – Unique Business Opportunitys last blog post..What Do You Want? I’ll definitely be looking forward to watching this movie. It sounds very interesting!! And I love to watch movies that provoke me to explore my thoughts. I’m always a little skeptical at first, but I’d be interested in having a look… I have to say I enjoyed ‘the secret’ also. SpaceAgeSage — Loris last blog post..Your kind of neighborhood … or not? @Ross – I really must go and get out The Secret. I’m about the only person who hasn’t watched it. @Lori – I’ll have to check out your water link! Hi Robin – This is awesome news. It sounds like this movie agrees with all that you’ve explained on this blog about the possibility of living forever. I will definitely be watching this over the Christmas holidays – it sounds amazing. What if there are other ways of living forever? What If? The movie is fantastic! It addresses what many people feel is true inside but few talk about…the possibility of living forever! The movie has great science and seemingly credible research but also people just sharing their own stories of unlimitidness. Personally, I think that if we were truly happy we would want to live forever and continue creating for the fun of it. What If? The movie discusses that perhaps we are already physically immortal and perfect but we have programs that are over-riding our own innate perfection. It’s wonderful that a film like this is available and has some big names like Dr. Bernie Siegel, Dr. Joe Dispenza, Brandon Bays, Dr. Bruce Lipton, Dr Emoto (the water crystal dude). Thumbs up!!!! Thanks to Jenny Mannion, I was led to your article about the “What If” movie and plan to write about it over at my blog after I learn it’s been subtitled for those who are in need of them because they can’t hear (that would be me) or they’re learning English but cannot understand it when it’s spoken. Great job whetting people’s appetite for the movie! I look forward to getting a copy of it after it’s been subtitled. What If? The Movie addresses so many more issues than The Secret or even What The Bleep Do We Know, in that it gives people hope and understanding about the idea that we are not victims of our circumstance, but instead, that we are agents of change in our own lives and in the lives of others! How truly exciting to think that we are capable of so much more than we think?! 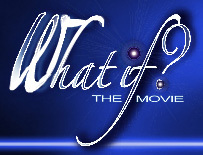 I have watched What If? The Movie numerous times already and each time I can feel new neural pathways being formed and my brain expanding, it is an incredibly liberating and amazing feeling! M.Grants last blog post..What If? The Movie is already breaking new ground! @Cath – I’ve seen it now and it is great – it has a chapter called “physical immortality”, which I didn’t know when I wrote this post. @John – I believe we are immortal spiritually, and always have been – and I am interested in taking the next step and overcoming death of the body. @Interested One – Oh Interested One! Thumbs up to you for bringing us your perspective – life should be fun, indeed. @Stephen – I understand from Jenny’s interviews that the makers have had a book offer – this might be a better option for deaf people – I’m guessing the interviews might be hard to follow with subtitles. Thanks for visiting! – great to hear from you. @M. Grant – hi there and welcome! So true – we are more than we think. Watch out for that expanding brain! (just kidding) – great to hear from you, Mercedes.